In 6C weather and challenging mixed conditions BlackArts Racing [BAR] took to the podium for the New Year's Eve 12 hour grand finale race of the 2018 Super Endurance Championship. 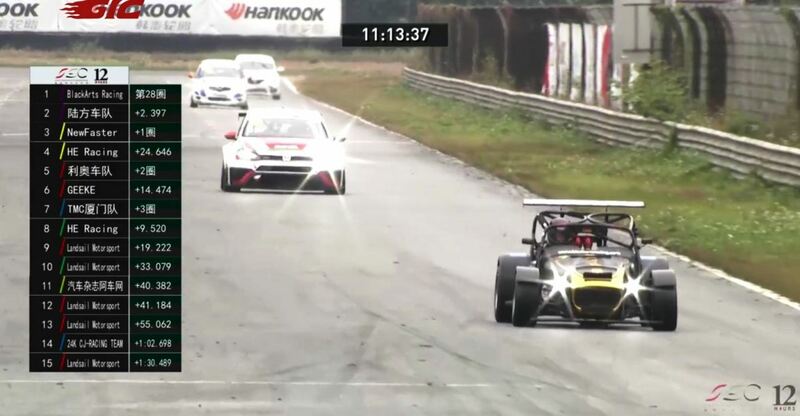 The race, which is the annual 12 hour event at the culmination of each Super Endurance Championship season, was broadcast live throughout China on CCTV and streamed online to tens of thousands of viewers. Americans Bill O'Brien and Pete Olson, Nigel Farmer of Scotland and British driver Scott Wrayton piloted a Caterham R500 to the Unlimited Class podium for BAR, with Farmer setting the fastest race lap of the 21 car field in the process. With Olson setting a 1:23.7 and fastest laptime in Friday's practice while on used tires, and Wrayton and Farmer setting a 1:22.8 and 1:22.9 on new slicks in Sunday's qualifying, there was no doubt that the Caterham had the pace to take the overall win in the Monday New Year's Eve race. On Monday, Nigel Farmer started the race's first stint of over an hour, putting the BAR Team's Caterham in the overall lead and setting the fastest lap of the 12 hour race in the process at 1:22.8, which would remain as the fastest lap of the 12 hour event until the checkered flag. Bill O'Brien took the wheel during the safety car period, staying on slicks only to be caught in increasing rain. After being hit in the left front while passing a slower car, O'Brien pitted and the suspension damage cost the team a valuable hour in the pits. After the damage was fixed, Pete Olson went out on a mix of old and new slicks and a damp but drying track, managing to hold off the race leader despite having to aggressively scrub in the tires - until coming to a sudden halt with a right rear driveshaft and mounting failure during his first hour and a half stint. After the car was repaired, UK's Scott Wrayton took to the wheel and set a fast 1:22.9 in the process. Unfortunately Wrayton went into the gravel in T1 about an hour into his stint, with Farmer taking the wheel after the car was recovered. With Scot Nigel Farmer experiencing an engine misfire an hour into his second stint, American Bill O'Brien took the wheel again at the end of the race to put the BAR Caterham 2nd in the fastest 'Unlimited Class'. BELL Helmets-sponsored racer and BAR coach, American Pete Olson, said '…indeed we had our fair share of challenges, but no one said this was going to be easy. With the fastest car on the grid and the most challenging car to drive in the field of 21 cars, some incidents were to be expected. Unfortunately it was one too many but as the saying goes, 'that's racing'. The fact that we still managed to finish and take 2nd in Class after the long 12 hours was really something – and as it was our first 12 hour effort in this car, we learned what we needed to learn to be on top of the game for the next one." For more information on BlackArts Racing, please visit http://www.BlackArtsRacing.com.